Like a lot of young footballers, Leeds midfielder Alex Mowatt’s focus is first-team selection and playing on a regular basis, but concedes it’s not easy to block out the happenings at Elland Road. Phil Hay reports. Footballers need distinctive signatures and Alex Mowatt has perfected his: sweeps and curves which wrap around the figure 27, his shirt number at Leeds United. Mowatt has taken it. He has the trophies to prove it. At the end of last season – his first as a professional – he was named as young player of the year by Leeds and tomorrow, before their final league game at home to Rotherham United, he will receive the YEP’s player-of-the-year award. Further prizes might come his way at the club’s official awards ceremony tomorrow night. Mowatt says his house is full of trophies, many of them won with Bentley Pumas, the junior team he played for in Doncaster. “There was nothing better,” he says. “At the end of the year you wanted to feel like you’d had a good season.” But his most recent prizes are different; acknowledgments which say he has not only broken through at Elland Road but risen to the top. The poll for this season’s YEP award was tight, with Mowatt and Lewis Cook separated by two votes. The fact that it resulted in a straight contest between a 20-year-old and an 18-year-old tells a story about United’s season and the inspiration behind the better parts of it. Mowatt wonders if his goals – nine and several of them spectacular – tipped the balance in his favour. “Quite a few players have played well all season,” he says. “Maybe I deserve it (the award) but if it was going to someone else then I couldn’t argue. I’ve scored a lot of goals, or a lot more than I did last season – more like the number I want to be scoring. It’s probably helped. The quality of Mowatt’s finishing has almost mattered less than the timing of his goals. In a squad where only Mirco Antenucci has reached double figures, Mowatt found a way to carry Leeds at a critical point of the season. Edge-of-the-box strikes against Middlesbrough, Millwall and Wigan yielded three 1-0 wins in the space of three weeks and by the middle of March, United no longer worried about relegation. Mowatt says it was never a worry for him, even when United finished 2014 a point and a place above the Championship’s bottom three. “I didn’t ever think about that. There was a time when we weren’t getting points and it did get frustrating but the weeks go quick and the games come round. You don’t have time to think about the table – and it’s not like you aren’t trying to win every game anyway. It’s a vote of confidence in a squad which, to some on the outside, appeared at times to suffer from a lack of form, cohesion and unity. Fifteen players came to Elland Road last summer and three more were signed in January, the majority arriving from abroad. Only the players know how well the group has knitted together but the controversial withdrawal of six players before last month’s defeat at Charlton – withdrawals which Leeds said were down to genuine injuries – did not help to paint the picture of a happy camp. 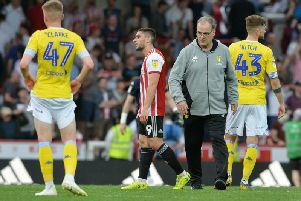 The affinity that Mowatt, Cook, Sam Byram and Charlie Taylor share with Redfearn is shared in equal measure with each other. Mowatt says playing with those three is like “playing with my mates”. “That’s how it’s always been,” he says. “The reason we won the league with the Under-18s (two years ago, when Mowatt was captain) was because of how close we were as a team. Leeds contend that none of their four emerging assets – Mowatt, Cook, Byram or Taylor – will be sold this summer and insist their intention is to negotiate new contracts with them. Mowatt says he has had no offer and no negotiations but his deal runs for another two seasons. Cook and Byram are more exposed, with both out of contract in a year’s time. Around the club, many are clinging to the talent of these four. It created a light in the gloom during Massimo Cellino’s first year as owner, something for supporters to cling to. “The crowd liking you can only be a good thing,” Mowatt says, “but they only like you if you play well and put in performances. Does Mowatt understand why so many fear that his classy left foot or Cook’s irrepressible ability will lead to transfers elsewhere? “Leeds have sold young players in the past so I can see why people feel like that,” he says. “It would be gutting if anyone left but we don’t speak about it. It’s not like the four of us stand about and joke about who’s going to be going.